> Events in Connecticut > Heaven and Nature Sing! 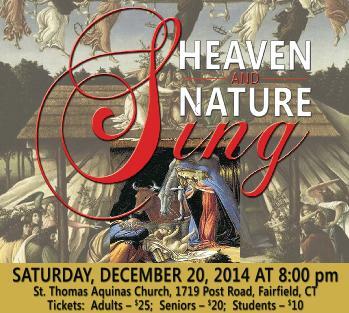 Heaven and Nature Sing will feature John Rutter's Gloria and Ralph Vaughan Williams' Fantasia on Christmas Carols, as well as many other Christmas selections. Come celebrate the holidays with jubilant and exalted sounds of the season!